This is what Atlantic Dunes’ 15th hole looked like before Hurricane Matthew hit the Sea Pines Resort. Davis Love III had barely finished savoring his team’s victory in the Ryder Cup when the U.S. captain had another event to celebrate. 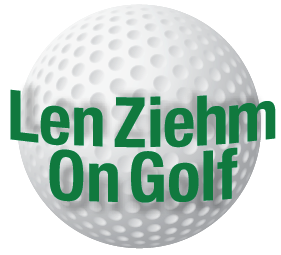 His Atlantic Dunes course was to open a day later at South Carolina’s Hilton Head Island. That opening, though, never happened. Hurricane Matthew caused damage from Florida to South Carolina, but none were more adversely affected than the Sea Pines Resort on Hilton Head. Many residents couldn’t return to their homes and some of those who could were still without power nearly a week after Matthew battered the Island with 88 mile-per-hour winds and a storm surge upwards of 12 feet. 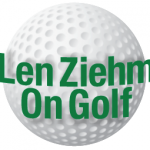 The status of all the Hilton Head golf courses remained very much in limbo, with no dates set for their re-openings. The much-anticipated opening of Atlantic Dunes is also in doubt. Love’s design firm had completed a complete renovation of the Ocean Course — the first 18-holer built on Hilton Head. When it’s available the re-design will provide a more seaside ambience to Sea Pines. 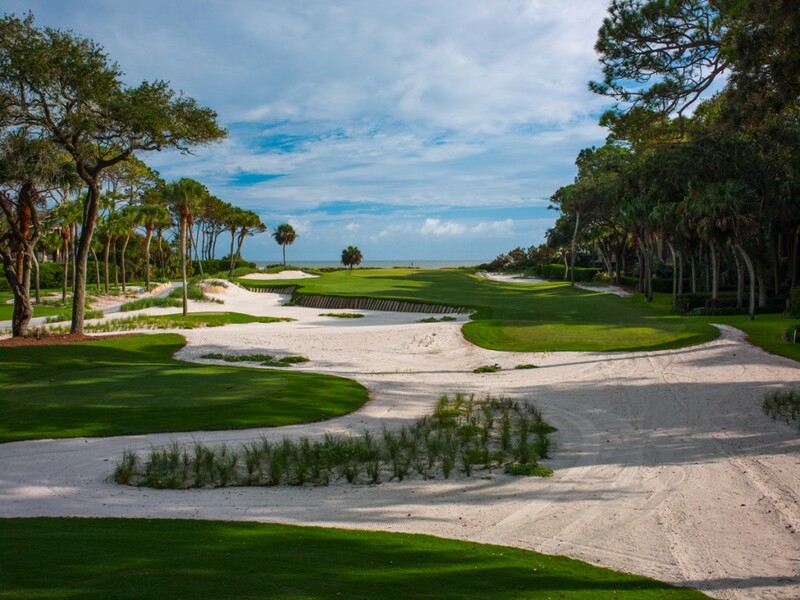 Atlantic Dunes will also be a nice complement to Sea Pines’ other courses – the Harbour Town Golf Links, jointly designed by Pete Dye and Jack Nicklaus, and Dye’s Heron Point. 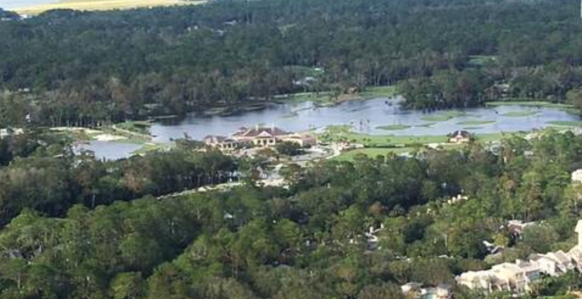 Collins Group Realty provided this aerial view of Sea Pines after Hurricane Matthew struck the area. 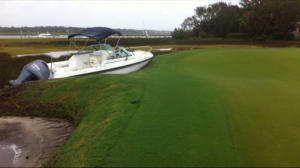 While Hilton Head got hit the hardest by the hurricane, other courses were impacted to lesser degrees. The King & Bear and Slammer & Squire courses at World Golf Village in St. Augustine, FL. 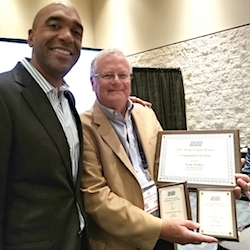 – to the south of Hilton Head – were “lucky,’’ according to general manager Jim Hahn. He reported fallen trees, flooding, damaged bunkers and debris but expects both courses to be re-open before the week is out. Thirty-eight courses in Myrtle Beach, S.C., — to the north – were reported closed because of storm damage but 22 of those were scheduled to re-open on Wednesday, Oct. 12, and eight more set their re-openings for no more than six days after that. Power outages were the main problem for the courses in Charleston, S.C. The course hit the hardest was The Links at Stono Ferry, which lost over 50 trees and was unable to determine a re-opening date. Wild Dunes, one of the bigger resorts in the area and one that had suffered badly in previous hurricanes, was back in operation in just a few days and another, Kiawah, planned to open on Friday. Only one major competition was affected by Matthew. The Web.com Tour Championship at Atlantic Beach, FL., was cancelled. Somehow a boat found its way to a Hilton Head course while Hurricane Matthew was doing its damage. (Collins Group Realty photo). The greens were converted from bentgrass to Champion Bermuda, a growing trend in that area, and most of the more than 75 bunkers were eliminated from Talamore’s original layout. They were replaced in part by 12 sod wall bunkers – the first to be built at Pinehurst. The National Club Cottages, adjacent to the Tom Fazio-designed National Course at Reynolds Lake Oconee in Greensboro, Ga., are now available. They’re the latest addition to National Village, an ongoing $40 million investment in progress at the resort that features six courses. Each of the Cottages can accommodate eight people. They have four bedrooms, 4 ½ baths, a full kitchen, two open living space areas and an expansive porch area. The clubhouse and golf shop at National Village had been renovated prior to the opening of the Cottages. National Tavern, the newest restaurant on the premises, has become the centerpiece of the area. 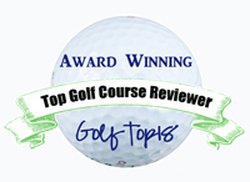 Golf-rich Michigan again leads the Midwest with courses ranked in Golf Magazine’s Top 100. It has five – Forest Dunes, Arcadia Bluffs, Greywalls, Tullymore and Bay Harbor. Only five other states have more courses ranked in the Top 100. Michigan will also have another candidate for top honors next year. Sloatin Brae has opened on a limited basis at the Scott family’s Gull Lake View Resort in Augusta, Mich. Sloatin Brae is the first on the premises not designed by members of the Scott family. Renaissance Golf Design, Tom Doak’s firm in Traverse City, Mich., designed the new course (though Doak isn’t the architect of record). Sloatin Brae opened a 12-hole loop to provide a sneak preview of the full layout that will open in 2017. Old Kinderhook, in Camdenton, Mo., has scheduled its Golf Appreciation Stay & Play packages for Oct. 23-31. 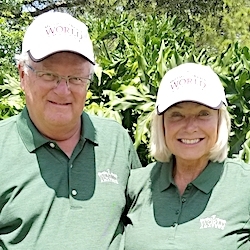 The Glen Club, in Glenview, IL., will host the World Speedgolf Championship from Oct. 17-18. Chicago’s Medinah Country Club will host the Bush Cup on Friday. It’s a college match pitting the men’s teams of Army and Northwestern.